Today I found out that I’ve been awarded the The Spirit of Dedication Award For Best Author of Children’s Science Fiction and Fantasy by the European Science Fiction Society at their annual Eurocon convention in St. Petersburg. I never win things. This is just so amazing! I can’t quite believe it yet. I get an award jointly with the Russian illustrator Anton Lomaev, whose art is simply breathtaking! The lovely Gar Kavanagh is bringing it back for me and in the meantime sent me photos! 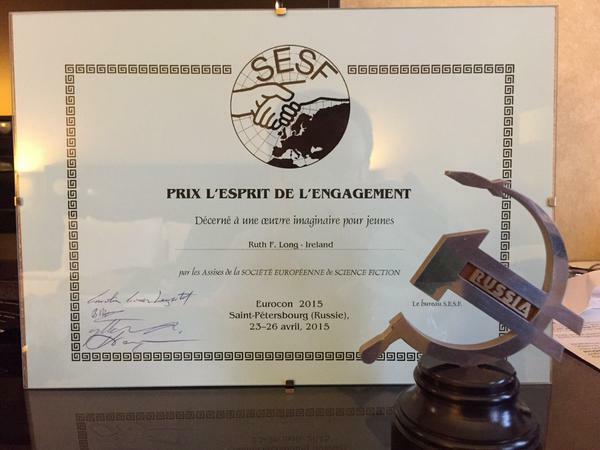 The full list of awards is available on the ESFS website here. So it really is real and my goodness what a list to be on! Congrats to everyone on it, especially Song of the Sea (can’t wait to see it) and Liz Bourke! I’m over the moon! (no pun intended! ), especially after a very bleak week. Thank you so much! The Stone’s Heart is out today!